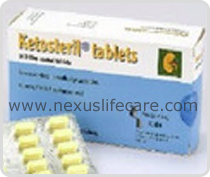 Ketosteril Tablets distributors, dealers & suppliers in Mumbai. Uses:- Ketosteril Tablets is generally known as Compound Ketosteril Tablets and it is used for preventing and treating renal damages due to protein metabolism disorder in chronic kidney disease (CKD) and the effects are better with low-protein diets. Side Effects:- Mild nausea and vomiting, Diarrhea or constipation, Swelling in hands, ankles, or feet, skin rash, numbness Drowsiness and hair loss.